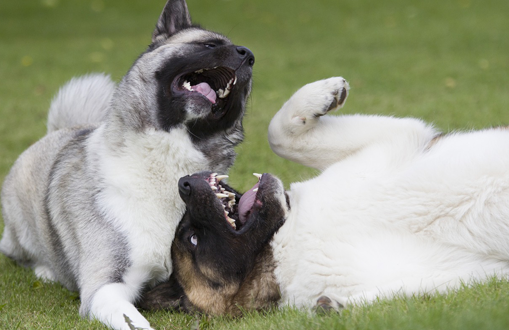 When you see two dogs wrestling, it’s not always easy to determine whether they are playing or fighting. 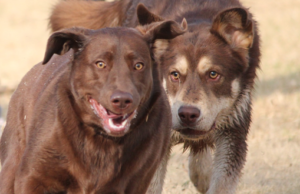 In those cases, owners face a dilemma whether to intervene or not. Spotting this difference isn’t easy, but there are ways of finding out which kind of behaviour it is. Puppies often play with their siblings from the same litter, so it’s perfectly normal when they play. From the second week of their life, when they start to open their eyes, up until the point they go to their new homes, they spend all their time together. That period is very important for the social development of every puppy, as that is the time when they learn dog manners. People enjoy watching them, and, for them, it’s excellent practice and a desirable form of socialization. Jumping up and down. 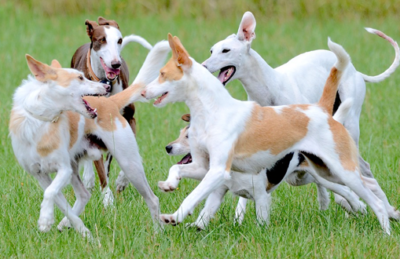 Dogs often do this to show that they want to play, so they jump up and down over and over again. The dog’s mouth is wide open, looking silly and cute. Very loud and incessant growling and howling. 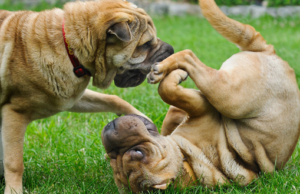 Dogs intentionally act “vulnerable“, when they fall to the ground and expose their stomach, or allow other dogs to catch them when they play and chase around, taking turns. They keep coming back for more. Even a dog that ends up on the ground lying on its back won’t stop playing. The dog’s body is stiff and the hair on the upper part of the back is standing on end. The jaw is closed, the mouth is turned downwards, there is quiet growling meant to warn. There’s no jumping as is the case when playing, the movements are quick and brisk. If it is, in fact, a real fight, the encounter is very short, and the losing dog will try to escape very quickly. The dog tries to escape the other one. There’s no jumping around, the tail is down, and it’s obvious the dog is not comfortable. Another useful piece of advice to spot a potential fight is not to incorporate toys into their playtime. Most dogs are very possessive when it comes to their toys or food. If you have more than one dog, make sure each has its own toy. 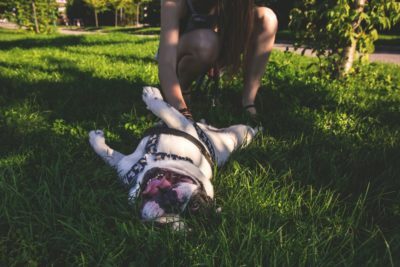 If you are at the park with your dog, don’t bring toys at all, to avoid a problem with other dogs. Previous article Agility: The origins, rules, and agility training!